Meall Garbh is much bulkier than its neighbour, An Stuc, though identical in altitude. 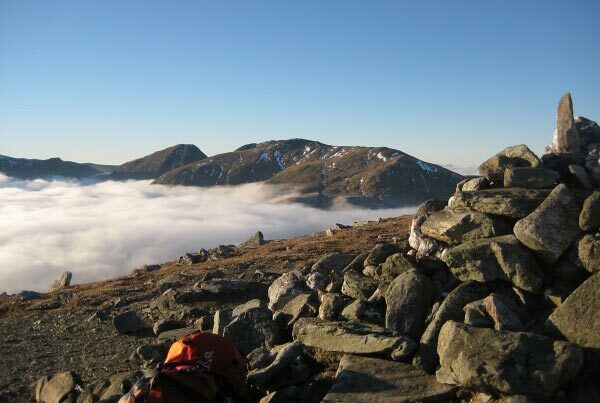 The broad summit lies close to the narrow SW ridge, with some crags, leading to An Stuc. There are a further four broad ridges making for an easy ascent from most directions. The terrain is grass with some outcrops and the steepest slopes lie to the S and SE (Creag a' Bhuic). Meall Garbh is normally climbed from the Lawers Burn to the bealach between it and Meall Greigh. 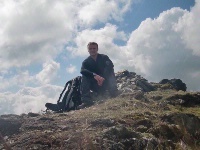 It is also accessed from An Stuc as part of the Lawers Ridge. 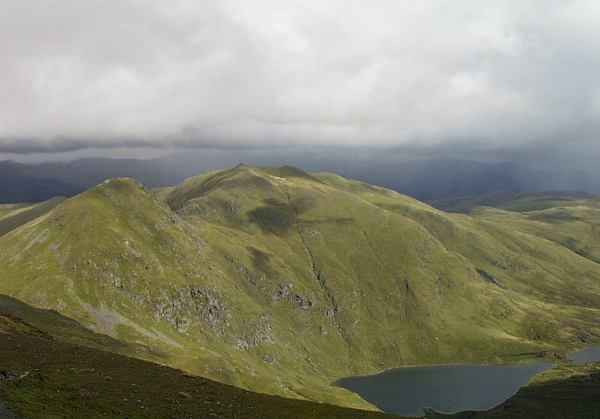 Meall Garbh with An Stuc in the left foreground viewed from Ben Lawers. 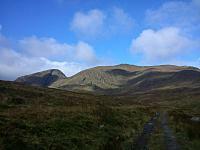 The summary information of one or more ascent routes that include Meall Garbh [Lawers region]. 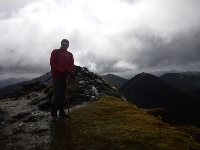 1 1175 m 13.67 km 5 hrs Meall Garbh [Lawers region] and Meall Greigh Easy day on moderate grassy slopes. Post a few words about Meall Garbh [Lawers region] or read what others have had to say. After reaching the top of Meall Greigh (and then the other cairn) myself and two other walkers I had met followed the path alongside the fence to the summit of Meall Garbh, where we could still see nothing in the thick cloud. Our descent was a steep one with lots of careful navigation down to the Lawers burn through Creag a' Bhuic and then down to the path at the dam (where we finally came out of the cloud). Only meant to bag Beinn Ghlas then Ben Lawers and head home as we had a big day with ropes in Glen Coe (Three Sisters) the next day. The weather was the best that its been all year, so decided to continue onto An Stuc, ended up also doing Meall Garbh and finally Meall Greigh. As I had already done Ghlas but my friend Marty hadn't we ran up it in an hour, in fact you could drive a bus up there. It as a perfect day, visibility for hundreds of miles and we were above any clouds that did attempt to appear. Dropped down to the col and then back up to ascend Lawers. Quite an easy climb with few technicalities. Enjoyed an early lunch on the summit then decided the day was too good to stop there. Onto An Stuc, tricky descend off the NE of Lawers, large frozen snow slope forced us to put crampons on, became steep on ascent again, but no real difficulties. Good scarmble down other side, Meall Greigh and Meall Garbh were a bit disappointing after the scramble. 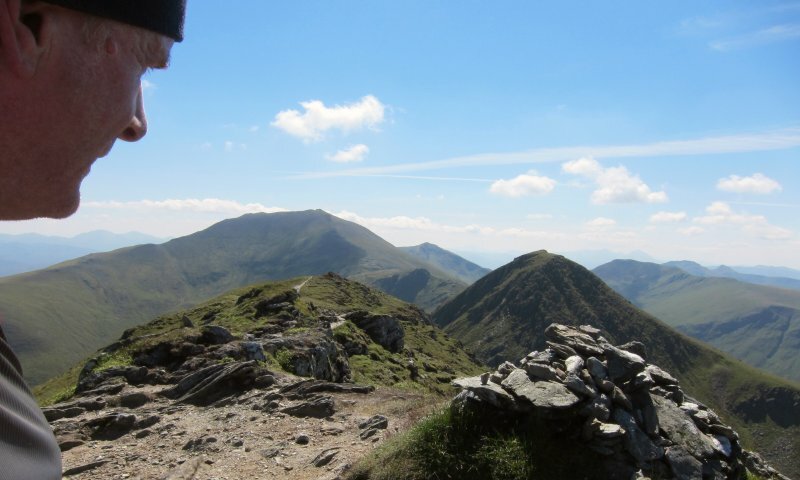 An easy ascent, convenient access on the Lawers burn path, and a fantastic viewpoint - the best in the range probably - make this a excellent mountain to climb in its own right. Followed the Lawers Burn path to the dam before crossing over and heading up to the right of the craggy slopes immediately south of the summit. 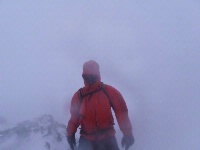 Beware in mist of a false summit if approaching from the east. 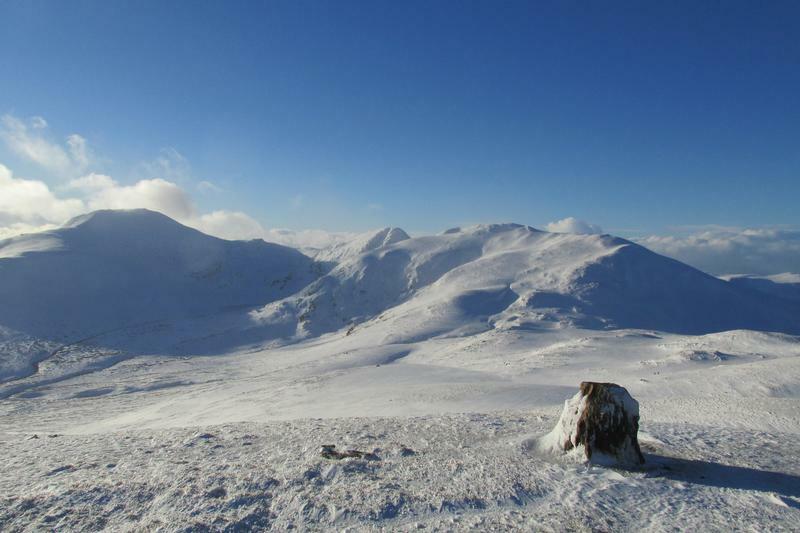 A good mountain on a clear day with superb views north as far as Ben Nevis and a good point to view the slopes of An Stuc. A relatively accessable peak ofering the oportunity to climb Meall Greigh on the same day.